It may be hard to imagine given the success of Pride in Toronto, but there was a time when the LGBT community faced violent persecution and outward hatred in Canada’s largest and most diverse city. Thankfully, these days have passed, but a street art project has been underway to document the often ignored history of the LGBT community in Toronto, and to celebrate the community’s growth and, well, pride. The Church St. Mural Project started last August after years of planning, strategizing, and permit-applying, successfully bringing 12 murals to various locations up and down the hub of Toronto’s Gay Village neighbourhood. Overall, 25 artists all helped bring the history and success of the LGBT community to the streets for all to see and enjoy. While many of the murals celebrate the community, they do not shy away from their struggles. 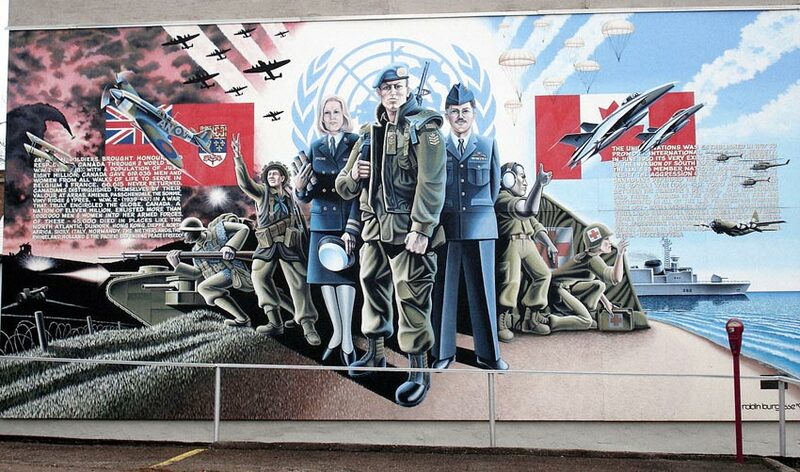 One mural depicting Operation Soap, also known as the Bath House Raids, is a prominent mural. Showing a drag queen with their hands up and surrounded by emergency vehicles, the mural directly references Canada’s own version of the Stonewall Riots, where Pride Week got its start and the LGBT began a new wave of their fight for equality. They also document the community’s long history and famous faces, the people integral to what is now one of the world’s greatest places for LGBT members. A large, 91-foot mural depicts over 50 years of club culture, with references to specific people and places that are important to Church St.’s history. Each person and place was extensively researched for an authentic piece that is wholly Torontonian. Some murals are more abstract, challenging the ways we think about intimacy between individuals to show that attraction and love do not need to be limited to constructions around gender and sexuality. And many of the murals aren’t limited to paint either. The mural on Church and Wellesley, for example, takes inspiration from South Asian textiles for a mural that, appropriately, honours the queer South Asian community. For “ELLA” at 383 Church St., tiles were the major medium, used to create a ten foot tall mosaic. Each mural design was carefully selected from countless suggestions by local and international artists, all eager to offer their artistic talent to the local LGBT community. As if a walk down Church St. isn’t already fun enough, especially during pride, these murals add another dimension to the city, reminding the local community of how hard they have fought and exactly why the fight still matters. Brazil today is internationally renowned for its grafitti and street art scene, intensified recently by the 2014 FIFA World Cup. The whole country embraces their street art scene more than many other countries, with some municipalities passing laws to encourage street art. The city of São Paulo, for example, has banned public advertising like billboards, freeing up more space for street artists to create and display their talents. Perhaps one of the reasons São Paulo has laws to encourage street art is because they are the birthplace of one, or rightly two, of Brazil’s most important and influential street artists. Born Otavio and Gustavo Pandolfo, these identical twins are better known as Os Gêmeos, the Portuguese word for twins. But even those who don’t know their name would know their work in Brazil, it has come to dominate and guide the country’s street art aesthetics. The twins were born in 1974 and grew up just as hip-hop began its swift movement through Central and South America. The familiar beats and youthful energy captured the attention of Brazil’s youth, including Otavio and Gustavo. They started out as breakdancers, but soon graffiti became their favourite activity. At the time, the New York street art scene was the most prevalent and famous in the world and the twins began tagging and reproducing the style that could be seen all over NYC. They weren’t interested in their own style at the time and, much like the early adoption of any artistic practice, reproduction was vastly more interesting than creating something entirely new. Os Gêmeos, as we all know now, quickly became disinterested in mere reproduction, and a definitive style that incorporated Brazilian aesthetic, folklore, and culture began showing up in their work. A chance encounter with Barry McGee, then known as Twist, gave the twins their first direct contact with an American graffiti artist. McGee was in Brazil for several months for school and provided local artists with examples of the New York scene as it was happening. McGee also put Os Gêmeos in contact with other artists and street art professionals, giving them a way to advertise themselves outside Brazil. Os Gêmeos began experimenting with their style and giving their work a distinctive Brazilian flavour, including differing colour palettes, subjects, and approaches from their New York influences. A trademark for their work now, the yellow skin of many of their characters actually comes from dreams they have both had that feature people with yellow skin. They started making overt political statements as well, focused on local issues of poverty and infrastructure in their homeland. Nowadays, Os Gêmeos’ work can be seen all over the world, from Europe to North America to all over their native land. Special commissions include art festivals around the world and, surprisingly, local transit systems in Brazil, who are famously against street art on their trains. Murals and graffiti have become part of Brazil’s cultural makeup, individual expressions that together help a local and national identity, and two artists working under one name are a large part of this continuing mode of expression and internationally renowned scene. Their name is Os Gêmeos. From the first kick-off of Brazil vs. Croatia to Mario Götze’s extra time goal for Germany, this year’s FIFA World Cup was a whirlwind of emotion. Disappointment for Argentina, who made it further than anyone expected, anger for Brazil’s devastating 7-1 loss to Germany, and joy for many other nations. Names were made, legends finished their careers, and nations stood captivated. If the FIFA World Cup proves one thing, it’s that soccer (or football) is truly the world’s game, and one painter decided to put all that emotion into one amazing piece of street art. In fact, major metropolitan sectors have passed laws that only encourage street art. Sao Paulo, for example, has a ban on public advertising like billboards, so there is ample more space for artists to take over and add their own flavour to their cities. In Brazil, street art is exactly like New York in the 70s, except for the complete opposite. Both are covered from street to building tops with graffiti, but in Brazil, it’s part of the culture and entirely encouraged. The mural combines World Cup highlights, world flags, and Brazilian points of interest. Jambeiro combined World Cup highlights, world flags, and the most famous places in Brazil, fully encapsulating what makes these types of sports tournaments so wonderful. Jambeiro also made full use of technology, his smartphone always at the ready to capture famous photos of particularly incredible moments: Neymar’s tragic injury, Guillermo Ochoa’s incredible save in Mexico vs. Croatia, the list goes on. Coupled with the flags weaving in and out of the images, the fans holding their signs and their breaths, Jambeiro’s mural is a testament to all that made the World Cup particularly memorable. One of the worst things a muralist can do is not consider where they are painting, doing the right research for what they want to paint in a particular place. Every city, every town has a different energy, different sets of prioritues, and different values. For the muralists who painted the Wrigley Stadium, these mistakes were made. Of course, for people who don’t live in Chicago, the new Wrigley mural was a set of funny circumstances, it was a bit of an insult. Street art celebrates, it discusses, it even mocks, but it should never be wrong from a lack of research. The Wrigley Stadium mural went up earlier this year to commemorate the 100th anniversary of Wrigley Field, home of the Chicago Cubs for 98 of those years. It is a large mural, depicting many historical moments that took place in and around that stadium. For Chicago, a town with a rich history that many of its citizens take very seriously, the mural was a testament to the town’s pride and resolve. The main mistake came from what Cubs spokesman Julian Green described as (and I paraphrase) “incorrect labelling.” Green said in a statement that “[We] worked to source a significant number of photos from outside archives to highlight this wonderful milestone all season long. 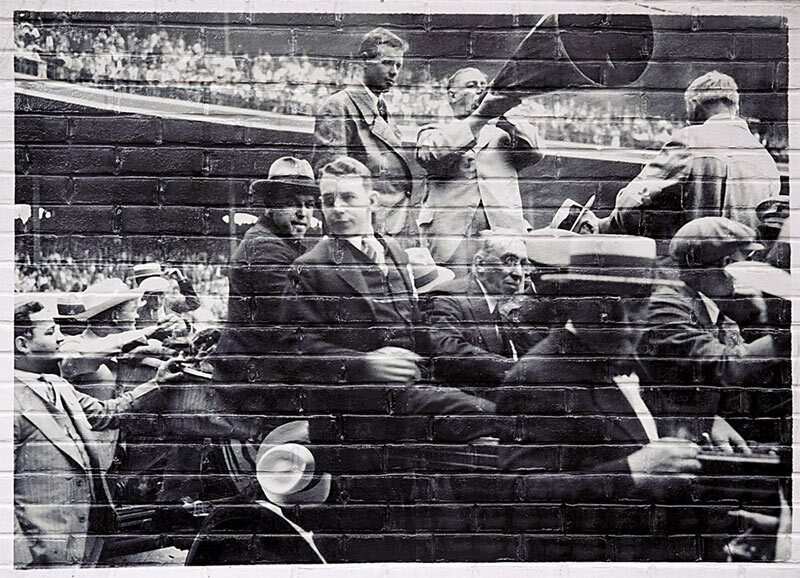 Unfortunately, the photo featuring Charles Lindbergh was incorrectly labeled in a collection of historical photos we recently acquired for our Cubs archives.” The result was a picture of Charles Lindbergh visiting Comiskey Park, home of the White Sox, not the Cubs. The error was originally pointed out by Cubs historian Floyd Sullivan, who discovered the mistake and notified the Cubs before mentioning it in his blog. He wasn’t exactly direct, turning the mistake into a game for his readers. Posting some pictures of the mural, Sullivan promised a copy of his upcoming book to the first 5 people who correctly identified the mistake. The result only made matters worse. More mistakes were discovered, from misspelt names to incorrect labels. One was discovered initially because the official posted picture actually contained the mistake in the photo’s URL, triggering some people to cross-reference the image to discover the year was wrong. Gabby Hartnett’s name was missing the last ’t’ too, a simple but glaring error after fans started combing over the mural with a fine tooth comb. Other errors included calling Franlkin Roosevelt “President” despite the photo referenced being from before he was elected and a mitt depicting a patch that couldn’t have existed when and where they claimed the image was from. Thankfully, officials have recognized these mistakes and fixed them, much to the relief of Cubs fans and baseball history fans across the globe. Repairs were made within just a few weeks of Sullivan’s article. There are a couple of lessons we can learn from the “Wrigley Field gaffes,” as the local media called them. Mostly, research is a street artist’s best friend. Many murals are commemorative, and that requires a certain amount of real dedication and respect for the people who would want the commemoration. The classic “know your audience.” The murals themselves are brilliant and skillfully made, hopefully the quick fixes will help fans enjoy Wrigley Stadium’s newest additions for a long time. Nestled in the Ottawa Valley, Pembroke has plenty of reasons to be famous. It’s the first Canadian city to have electric streetlights, first turned on in 1884, and home to plenty of historical site, so many that the town offers different walking tours for different parts of history. But what Pembroke is most famous for in the art community is being Canada’s largest outdoor art gallery, collectively called The Pembroke Heritage Murals. They are a collection of over 30 large scale murals that explore this community’s rich history, a project that fosters a community and brings tourism to the small community. Pembroke is a quiet community nestled in the Ottawa Valley. Home to just over 16,000 people, the small town is actually a historical gem for Ontario and Canada as a whole. It’s the first town to get electric streetlights, switched on in 1884, and has a rich history dating back to the early 1800s. But for art enthusiasts, especially lovers of outdoor and street art, Pembroke is particularly famous. Pembroke has a long history of keeping its history in tact, restoring old buildings and centres for tourists and future generations and wearing its proud history on its sleeve. Tourists and locals can take walking tours, walk around to take in the art scene and festivals, and visit the city’s museums and restored buildings. The murals are professionally curated, with artists like Stephan Bell, Neil Blackwell, Marillyn Saffery, and Pierre Hardy all contributing murals over the years. Subjects range within Pembroke’s history, from its discovery in the early 1800s, through the First World War, and even a Grease-inspired homage to the 50s. What the Pembroke Heritage Murals project demonstrates is the role that outdoor art can have in defining a city’s identity, attracting tourists, and contributing to a larger dedication to a particular subject. For Pembroke, their history is not only a point of pride, but a viable and growing source of income for the city. With such a rich history and an ongoing dedication to keeping the city’s history alive and restored, Pembroke stands as an example of the power of street art. 3D graffiti has existed all over the world for at least 20 years and, like much of street art, concrete history is often difficult to ascertain. By the early 90s, 3D art was becoming more common as graffiti itself started to expand and take in varying influences. Being grounded in something inherently illegal, graffiti often takes in and incorporates existing art, sometimes to the point of plagiarism, so 3D artists draw on any number of influences, from Neoclassicism to the Renaissance, either turning well-known paintings into 3D experiences or lifting the classic and familiar art styles for their own original pieces. The major style they took, however, is “Trompe-l’œil,” meaning ‘to deceive the eye.’ The style focused on making paintings appear to violate their 2D construction. One notable piece, “Escaping Criticism” by Pere Borrell del Caso from 1874, features a child stepping out of the frame. At its heart, 3D street art takes Trompe-l’œil’s major themes to heart, the making of the unreal, the falsifying of “real world” experience, whether it be the sudden awareness that one may fall into a bottomless pit or seeing something familiar in a different medium and mode. As with other styles of graffiti, each artist has their own particular approach, but a combination of paint and chalk are usually used for the pieces. Standing at the perfect angle is also necessary to get the full illusion. Peeta’s artwork has an amazing write-up in The Atlantic that compares his striking and angular lettering to the New Aesthetic art movement, an art style that takes the digital familiar into the real world, like pixelated sculptures. Peeta has been working as a street artist since the 1993 and mostly focuses on lettering and typography. “I endeavour to realize the sculptural quality of individual letters,” Peeta says of his work in his bio, “I break them from their generic typographical form, stylizing them with shape and volume beyond its mere semantic function. Thus my own lettering is brought into the fluidity of the urban, where words are continuously ruptured from their own histories, readapted into idiom and gestures learned off the street.” In short, he makes letters, an everyday necessity, something unfamiliar. Wenner’s art most obviously takes from the Renaissance, taking familiar tropes and embedding them in the ground for people to look down into. Wenner’s placement itself is interesting. Whereas these classics are often larger than life, or placed so people can look at them head-on or or tilt their heads upwards, putting this style below our usual sight lines is a commentary in itself. Some of Wenner’s most striking pieces use the classicstyle with modern subject matter, juxtaposing a recognized era of “artistic genius” with contemporary world issues. As a former NASA artist, Wenner attempts to bring his hyperrealism to the streets, quite literally. Greg Brown, unlike many other 3D artists, is less concerned with accessibility and more with being open to interpretation. Some of his work uses common pieces, like painting an accent table onto a wall, to mess with the “real.” Others, like “Generosity,” appear as characters openly questioning the viewer. Brown frequently replaces actual in-house decor with 3D painting, making his art at once domestic and unnerving.